Drummer Matt Wilson has at least one Grammy nomination to his name. A feat possible only through creating wonderful music. 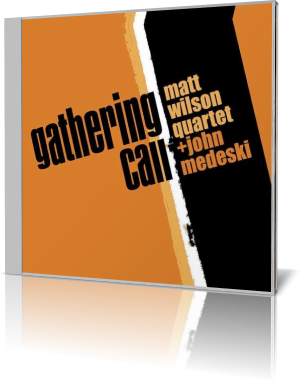 His 11th release as a leader is Gathering call (Palmetto Records, 2014), featuring the Matt Wilson Quartet and keyboard artist John Medeski. Born in 1964 in Knoxville, Illionois, Wilson has been featured on the covers of both DownBeat and JazzTimes magazines. His associations include Joe Lovano, Charlie Haden, Herbie Hancock, Elvis Costello, Bobby Hutcherson, Kenny Barron, Cedar Walton, Michael Brecker, Wynton Marsalis, Pat Metheny and others. The lineup for Gathering Call consists of Wilson, drums; Jeff Lederer, tenor and soprano saxophones, clarinet; Kirk Knuffke, cornet; Chris Lightcap, bass; and Medeski, piano. The set opens with a delightful take on Duke Ellington’s “Main Stem.” That’s followed by the startling-speed Matt Wilson original, “Some Assembly Required.” One can visualize the ant colony activity at a manufacturing plant as Leder puts the tenor through a blistering pace. Medeski’s solo represents the frantic recovery process that follows a conveyor belt freeze. Once the repair is made, Knuffke takes over, having the workers double their output to cover for lost time. Underneath, Wilson is the shop foreman who keeps pushing everyone to complete their assigned tasks. The title song is a free-form, mishmash of sound. Apart from the horns playing in unison, there’s no discernible melody or rhythm. It is, indeed, a “Gathering Call.” In contrast is the light-hearted take on Ellington’s “You Dirty Dog.” The rhythm section is tight as Knuffke and Lederer take turns with the lead. Gathering Call was assembled like a jam session. The album was recorded in one seven-hour session with little or no rehearsal. “We just played the music,” Wilson says. One can easily hear the fun the musicians had making this.